Reviews on boots are like reviews on pizza. Lots of different flavors with everyone having a favorite. The Quest 4D 2's are my favorite pizza. 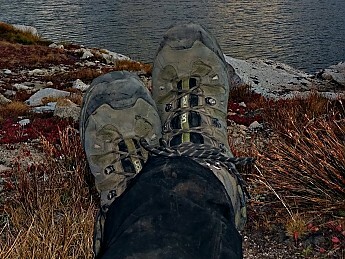 I only have about 140 miles on the Quest 4D 2's but with about 80 of them coming last week on a solo in the Eastern Sierras (go there....backpack there) I've been able to form a pretty strong opinion. A pretty basic one too. Best I've ever worn and I'm stoked to have found my way to them. 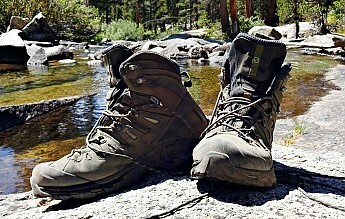 I lean towards midweight hikers that are made for backpacking but work on day hikes. The Quests, at only 2 lb. 7 oz. fit that bill perfectly. 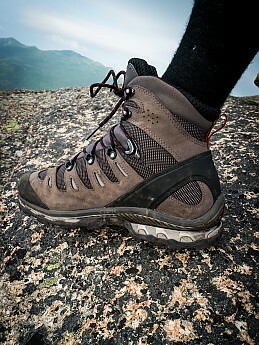 Excellent stability and underfoot protection on rocky trails but they still have some flex. And the lacing system is extraordinary. You've got a lot of control. For me, it feels like a custom fit every time. What really stands out to me is how my foot moves naturally in these boots. Having a wider foot sometimes means a pinky toe is getting hammered. But my toes splay naturally in these. And despite some long descents I've yet to feel any toe bang. Awesome. They don't blink in stream crossings but I've yet to wear them in extended rain or snow so I can't speak to their real waterproofness. I do know my feet don't feel hot and there's no urge to rip them off at the end of the day. I'm confident in the grip, but that's based almost entirely on dry weather. I've heard the"Contagrip" soles are solid in the wet though. The laces are strong but they do come untied. Double knot and you're good to go. I did notice a small rubber split where the toe rand connects. Not a big deal, and I fixed it, but I'll have to wait to see how these hold up over the long term. They seem exceptionally well made though. A lot of detail. 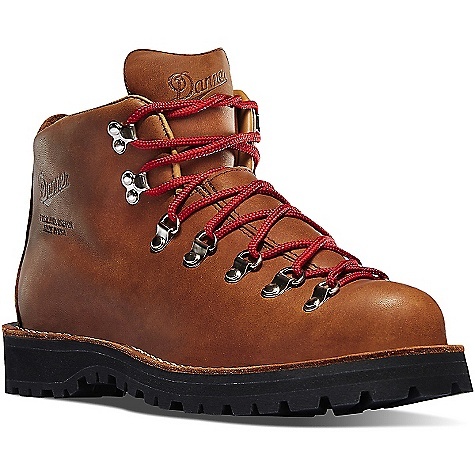 These are definitely technical hiking boots. The only real downside is the cost. I picked these up as part of an exchange for a pair that failed so my out of pocket cost wasn't much. But I know it won't be long until I'm asking myself, "Total comfort and performance or two hundred and thirty freaking dollars for a pair of boots?" Nice review, TJ! Thanks for taking the time to share it with us. I hope you'll keep us posted on how your Salomons continue to work out. 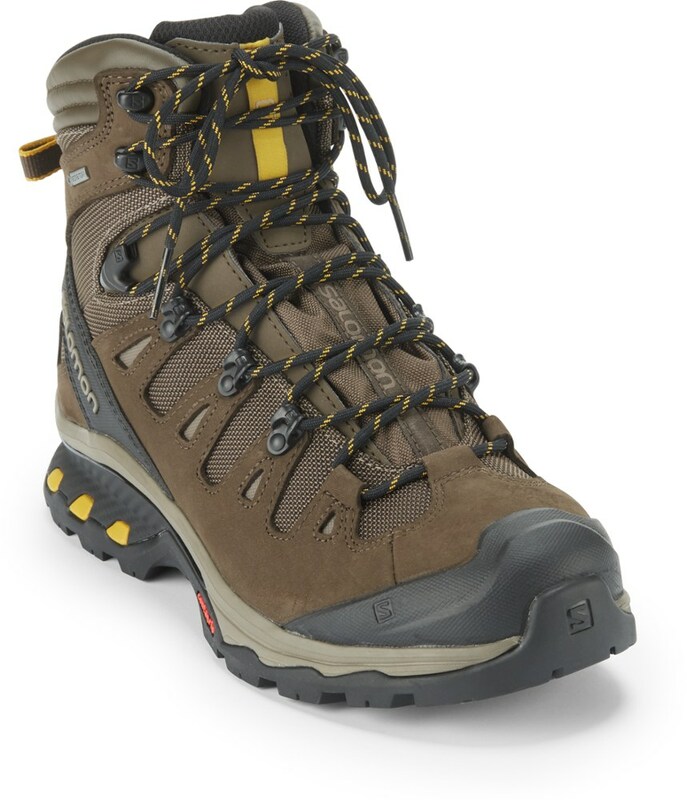 These boots are by far, the best hiking/light climbing boot I've owed. 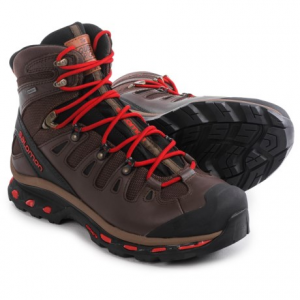 The rigidity of the boot is the right balance between comfort and support. With a medium weight sock they are warm enough for winter hikes or snowshoeing. The sizing is a bit large; you may have to go down a 1/2 a size. The only negative aspect of these boots is their traction. They are terrible on ice and quite slippery on smooth rock. The laces are very thick and difficult to keep tied, however the way they lock around your ankles is excellent. A fine boot, although a bit soft (especially for my liking). Bought this pair as a replacement for my leather boots that I’ve been using for years. 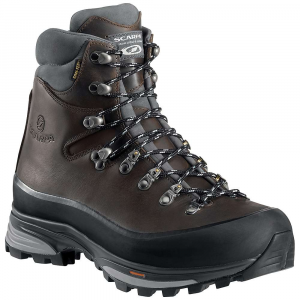 This is my first pair of boots with Gore-Tex that I have tried and I can say right now that I don’t like it. They get much too moist on the inside compared to regular leather boots and I have the feeling that they dry out much slower than non-waterproof hiking boots. I might still use them for hikes that I know will get wet, but I’ve never really have had problems with boots getting wet from water from the outside, using gaiters helps. This boot is very soft and comfy. I used it for the first time last weekend when I backpacked the Pemi loop (around 32 miles and 11,000’ of elevation gain). Overall, they did great. No blisters and my feet were feeling fine. The sole is soft, nearly like a pair of running shoe. There lies my second conundrum, because they are so soft, it's difficult to lace them tight enough to keep the heel in place. I normally prefer to tighten my boots a bit soft in the front to keep blood circulating and to keep a good insulating layer, and then tighten the boot more tight at the upper part, in order to keep the heel in place. This is very difficult to achieve with this boot. It's so soft, that it nearly feels like a running boot. I did run a bit on the trail with my backpack and the boot did just fine. The soles are grippy and seem fine on rocks, but I personally would have preferred a bit more stiff bottom sole. The tongue is VERY thin and has no support whatsoever. I had problems with tightening the boot enough without hurting my shins. This again illustrates how thin and lightweight this boot is. I think forrest hiking or hikes with less elevation and rocks would be the perfect playground for this boot. I will still rate the boot high, as long as it’s used for the right purpose. I bought these boots a month ago and they are great. Getting them laced up with the tongue proper is a little slow. I bought these boots a month ago and they are great. Right out of the box comfortable, no break-in period. Fully waterproof, I sat with my feet in a stream for 5 minutes, all dry inside. Wider in the toe which I needed. Lacing is a little slow. 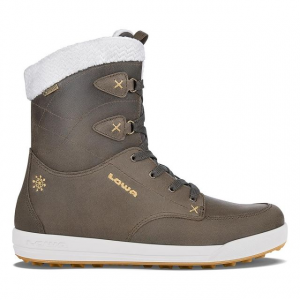 Very comfortable, minimal break-in time, waterproof, warm. Grip not the best on snow or ice. 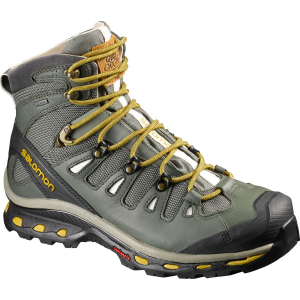 I've used these for hiking, backpacking, and climbing with and without crampons, on dry trail, muddy and wet trail, and alpine conditions. They are very comfortable boots, are fairly light, have good support and cushioning, and have taken some abuse with no ill effects. They are definitely waterproof and warm enough for snow (but still breathe well enough to be cool in warm weather), and clean up like new after being wet and muddy. They do take some break-in, I'd say 3-4 good hikes at least. The laces are strong but tend to get stuck in the big eyelets on the sides, making them difficult to get off sometimes, and the laces come loose if not double tied. The soles are good for most terrain but not great on snow or ice. My foot is about average width to a bit narrow and these fit well. The Salomon Men's Quest 4D 2 GTX is not available from the stores we monitor. It was last seen March 6, 2019	at CampSaver.com.